On November 20, 2018, leaders from McGill University traveled to Beijing to attend the first Joint Symposium on Primary Health Care, From Policy to Action: Strengthening Primary Health Care as the Foundation of our Health Systems. 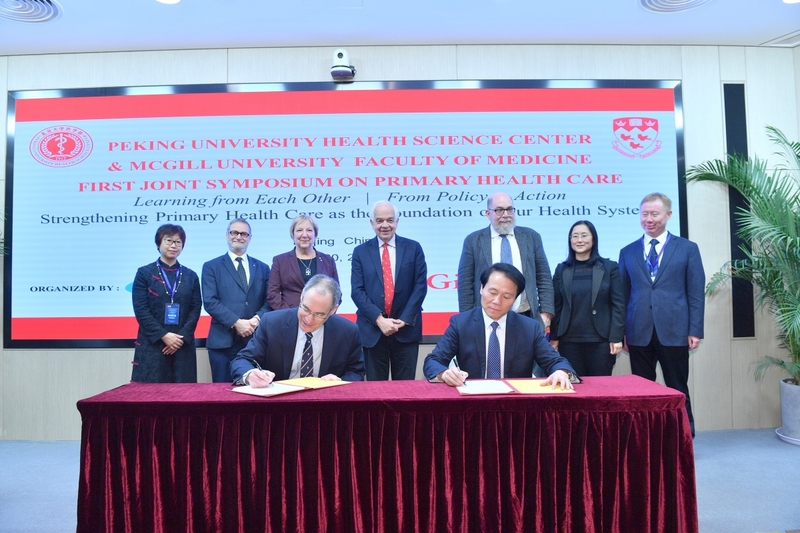 The two institutions connected on common goals and challenges, while learning from each other’s differences in approaches and policies, and signed a memorandum of understanding to pursue collaborations in care, education and research. Organized and hosted by Peking University’s China Center for Health Development Studies and the McGill University Department of Family Medicine, the symposium brought together more than 100 participants in primary care delivery and policy from Canada and China. Discussions focused on the state of primary care in both countries and the contextual factors to consider in defining future actions. The event was co-chaired by Prof. Xiaoyun Liu, Deputy Director of the China Center for Health Development Studies and Dr. Howard Bergman, Chair of the McGill Department of Family Medicine. The Canadian Ambassador to China, the Honourable John McCallum, was also in attendance. “China and Canada have already worked together for many decades in the areas of health and medicine and […] the best is still to come in terms of future cooperation in an era of many challenges, including the formidable challenge of an aging population,” he commented. During the plenary discussions, members from both delegations agreed that a strong primary care system was more effective and cost-efficient for caring for the majority of populations, as well as for managing chronic diseases and addressing an aging population. Some additional issues highlighted by the two countries included the need to increase collaboration between medical professionals, ensuring health equity across rural and urban populations, and maintaining patient-centered policies for care. Prof. Martha Crago, McGill’s Vice-Principal (Research and Innovation), emphasized the need for further research in primary care to support these efforts. “Research in primary care isn’t simply about the disease, it is about how we teach and how teachers are being taught and how we can make a difference when offering various forms of care to patients,” she said. In accordance with the Chinese government’s strategic plan for health services (commonly referred to as Healthy China 2030), medical schools in the country are working hand-in-hand with health professionals and external stakeholders to meet goals related to good health and well-being at all ages. To that end, the Chinese government is focusing on increasing the number of medical students and community health leaders involved in primary care, similar to Canada’s initiatives. Plans are already underway for a second joint symposium, to be held in Montreal in the fall of 2019.